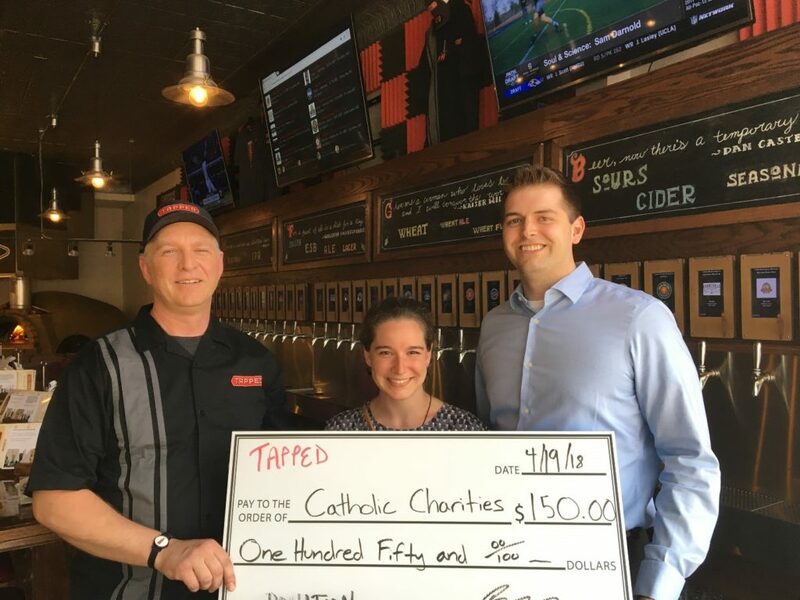 A big “Thanks” to Tapped in Maplewood for hosting our 2nd annual Young Professionals of Catholic Charities Happy Hour, April 12. The event was a great success, thanks to our eight Catholic Charities agencies, our co-host Saint Louis Young Adults, Tapped, and the roughly 100 young adults who came out to support us. Attendees enjoyed the innovative self-pour taproom and collecting “passport stickers” by visiting representatives from our eight federated agencies. Completed passports could be turned in for a chance to win a Tapped gift card. An all-around successful and enjoyable evening, the Happy Hour provided an opportunity for young adults to learn more about the various Catholic Charities agencies and their outreaches, as well as engage with other passionate young people in the area, all for a great cause. Tapped owners Ryan and Lindsay Reel generously donated a percentage of the evening’s sales that totaled $150; attendees contributed additional cash donations throughout the evening, as well. The event also brought increased awareness and interest in our Young Professionals Board. As a result, we look forward to adding new members soon. How truly blessed we are to be living in such a generous, Christ-centered community! 3) Core Leadership Team meets on the first Thursday evening of every month. If interested in learning more about the Core Leadership Team, please contact Brian Thouvenot at bthouvenot@ccstl.org.